Barry Perlmutter, president and managing director of BHS-Sonthofen, authors Solid-Liquid Filtration, an essential guide to the basic principles and mechanisms of filtration. The guide includes information on filter aids and filter media, types of filtration systems, selection of filtration systems and typical operating and troubleshooting approaches. It also discusses general applications and tips for process filtration and can be used by process engineers as a framework for “idea-generation” when analyzing filtration for an operating bottleneck issue or a new process development problem. Solid-Liquid Filtration is supported by industry examples designed to help solve real world problems. Solid-Liquid Filtration is part of the series Practical Guides in Chemical Engineering, short texts that provide a focused introductory view on a single subject. 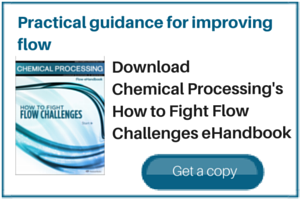 The full library spans the main topics in the chemical process industries that engineering professionals must understand. The pocket publications are easily carried or accessed electronically while working. Each text is highly practical and applied and presents first principles for engineers who need to quickly get up to speed in a new area.